This spring I began researching a paper analyzing the effectiveness of the NBA draft. The paper is still in the process, but I want to share some of my findings and hopefully garner some responses/comments. For the 2009-2010, there was a significant negative relationship between wins in 2006 and wins in 2010 (the 2010-2011 year had not finished when I last worked with the data). But, there was no correlation between wins in 2009 and a year 5 or so year in the past. Using a time-series analysis on team’s wins over the past 25 NBA seasons, I found that the only significant predictor of a team’s current number of wins was the previous year’s number of wins. 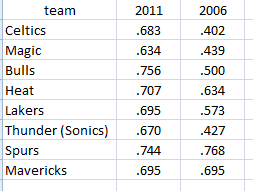 That is, teams that are winning now were not statistically significantly worse 5 (or so) years in the past. My conclusion was that the NBA’s amateur draft does not turn losing teams into winning teams. One additional conclusion I came to was that certain draft classes do matter. Specifically, I found that the draft classes of 1987, 1998, and 2003 turned losing teams into winners 7 years later. Each draft class turned some losing teams into significant winners. While only serving as anecdotal evidence, Lebron James turned the Cleveland Cavaliers from a 17 game winner in 2003 to 61 game winners in 2010 and from the draft class of 1998 both Dirk Nowitzki and Paul Pierce turned struggling teams into winners in the early 200s. My next thought is to account for draft pick number rather than losses, since the lottery does not ensure a reverse order. There are some interesting studies on the NBA draft including “Losing to Win” by Beck Taylor, which analyzed if teams intentionally lose games in a “race-to-the-bottom” in order to arrive at the top pick. Most analyses assumes that the NBA draft works, but my research points to an ineffective process of allocating rookie talent to the teams that need it most. This entry was posted in Economics, Sports and tagged draft, econometrics, nba, time-series. The World Series of Poker is currently on a 4 month break. The 6865 entrants have been whittled down to the November 9. Much of the action was shown LIVE on ESPN2. This is a variation on ESPN’s recent coverage, when the pocket cam revolutionized coverage and subsequently the game, which has been a series of tape delayed programs. This year’s audience is not privy to each players’ hole cards, but more importantly to the coverage, the announcers (Lon McEachern and a collection of analysts) are not privy to the hole cards. In many instances early in the coverage the announcers did not know the action at the table covered or the status of the tournament. During Saturday’s coverage, they even prematurely announced that Daniel Negreanu had been eliminated. In 2003, ESPN’s hole camera brought viewers to the table as if they were Sammy Farha staring into Chris Moneymaker’s wrap around shades while gnawing on an unlit cigarette. But the audience in 2011 is more versed in the nuances of the game eight years after the poker boom. WSOP fans needed something more than the same coverage from the past seven years; ESPN took a risk and on first glance it looks like a win. I wonder what the ratings will look like? This entry was posted in Sports and tagged espn, poker, wsop. Parents give their child a credit card. The child asks how much they can spend. The parents and child debate what the allowance should be, how much the child should pay, how much the parents should pay, etc. Nowhere does anybody even consider not paying the credit card company. The United States government is two weeks away from defaulting on its credit. A default would stymie the economy in the US and the world and shake up confidence in financial markets for a long time. This entry was posted in Economics and tagged debt. 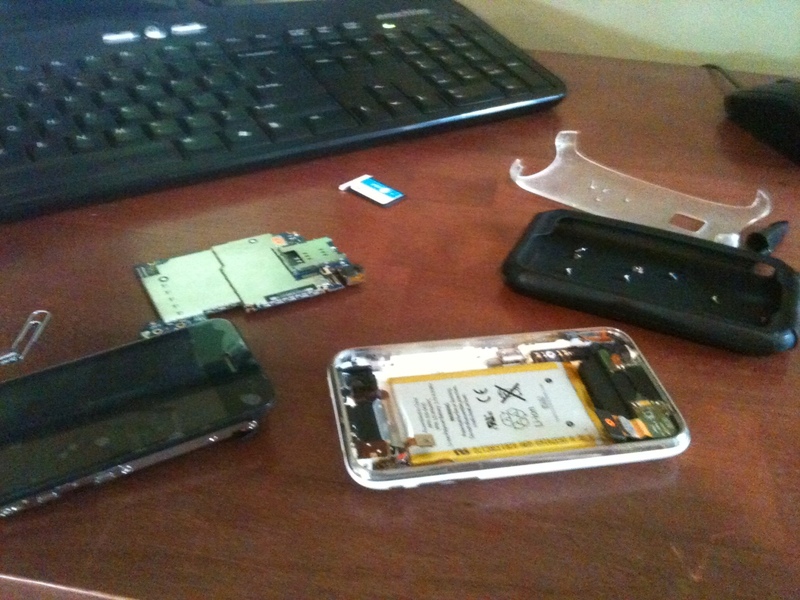 This entry was posted in Uncategorized and tagged iPhone.